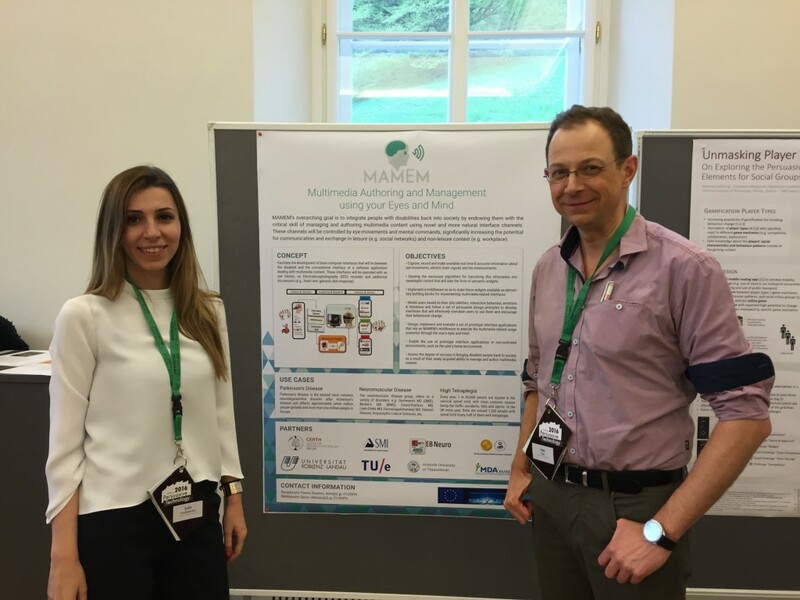 This April, the MAMEM project traveled to the 11th International Conference on Persuasive Technology (PT), in Salzburg, Austria. The PT 2016 brought together young and senior researchers as well as colleagues from industry (such as UX designers and developers, e.g. from Philips Research) who are working in the field of persuasive technologies. The overall goal of this community is to enrich people’s lives in various domains by supporting their personal goals to change their behavior. Thus, TU/e had the opportunity to present and explain the concept of MAMEM project, with a special focus on the personalized persuasive design approach of the system, to effectively stimulate the end-users, in order to accept, make use of and keep using this novel technology. This raised awareness of the project within the PT community, and resulted in fruitful discussions with various experts in this field, who demonstrated an interest in our approach and who are waiting for preliminary clinical validation and real use results.